Our NLP Training online courses have been crafted and designed for you to mirror the live NLP training experience. We know that your overall training experience with us and gaining internationally recognised professional qualifications are two things that are probably important to you. Our courses will deliver on both accounts. Gain accreditation through our online NLP courses and you will acquire the professional titles of Certified NLP Practitioner, NLP Master Practitioner, NLP Coach, NLP Master Coach and NLP Trainer. 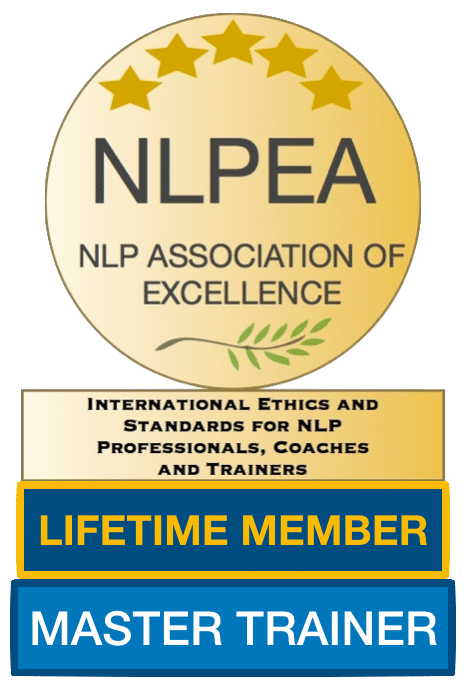 PROFESSIONAL RECOGNITION – Upon qualification from your course(s) we will register you for complimentary lifetime membership with your professional body (NLPEA – the International Guild of NLP) so that you are all set to go. It’s been invigorating, mind-blowing, empowering and has given me a real sense of confidence as a result of being able to understand the human mind and how it can be influenced. To say that I have enjoyed this course would be an understatement; it’s been mind-blowing at every interval. I enjoyed the course immensely and I think it came at the right time for me. I was also very impressed by your effort to truly become my coach during this time. Your replies and comments were always spot on and personal which made me feel very valued and special. It’s been a fascinating and enjoyable journey, made more pleasant by your mentorship and “company” through the many hours of your videos, and your responses to my feedback! Your training has certainly made a big and practical difference to me, and I am very grateful to you and all at Excellence Assured for the great work you do. Thank you, Anthony, for your incredibly intelligent, caring and genuinely loving way of communicating and presenting ideas, helping with advice and growing your students. Your online program is very special, as it has your heart in it. It is focused on giving students as much quality material and in as digestible, interesting and exciting way as possible. All the way through this course, I felt that you were always there for me: patient, attentive, immediately available; it has never felt as an on-line experience to me, and I now look forward to my Master’s course with much excitement. Thank you! The single biggest impact on me has had the realisation that our Unconscious can be so easily accessed through such seemingly simple techniques NLP offers. It never stops surprising me that some decades-old issues suddenly disappear just within minutes, that people previously unable to imagine an apple when you ask them to, would suddenly access memories of their previous lives, that a short hour of work with NLP can turn a lifetime of struggle into a great adventure. It is quite powerful! I am really thankful to have found and picked your course over other courses online. Not just because the course was amazingly easy to follow and learn from it but mostly because I truly feel I have a mentor behind me. I truly love helping people find their happiness and I can feel that you do too. Having your support has been extremely helpful and I can’t stress how appreciative I am. This training is delivered “as live” by recorded video modules, which means that you get exactly the same training as the students of our attended NLP Training Courses. You can watch the videos and listen to complimentary standalone audio versions as many times as you like. Each of our online NLP courses has an entire series of videos (over 20 hours of video for the Practitioner course alone). Don’t be fooled by poor imitations which only offer videoed demonstration modules. We aim to thrill you with the quality and depth of our courses. Learn at a pace that suits you and in the comfort of your own environment. You have full access to all of your course material online from the day that you make your investment. There is no deadline for completion of your course, so you can study at a pace to suit you. Every subject area has the following resources: Instructional videos, MP3 audio, comprehensive course manuals viewable and downloadable in our members area, demos, exercises and feedback assessment. I want you to be sure that this is the right investment for you. Ask me your questions, give me your thoughts or just request our Free NLP Training Online brochure, please complete the form below. How can we help you (Questions for Anthony)? Interested in getting an introduction to NLP and finding out how it can help you? The training is specifically designed for our NLP students and is available throughout the world. Our courses qualify as “Coaching Specific Training Hours” for membership of coaching organisations such as the International Coaching Federation (ICF). Our online NLP courses provide the equivalent NLP certification to one of our attended courses. Your time spent on our e-Learning portal combined with time completing our full certification requirements and content integration assessments enable us to fully assess your competence as you progress through your course and as you gain your final certification. Because we can limit our costs through the provision of training via this medium, we can save you money in your development through NLP with no compromise on quality or results. Anthony Beardsell invites you to let him be your personal trainer and coach for the duration of the training. 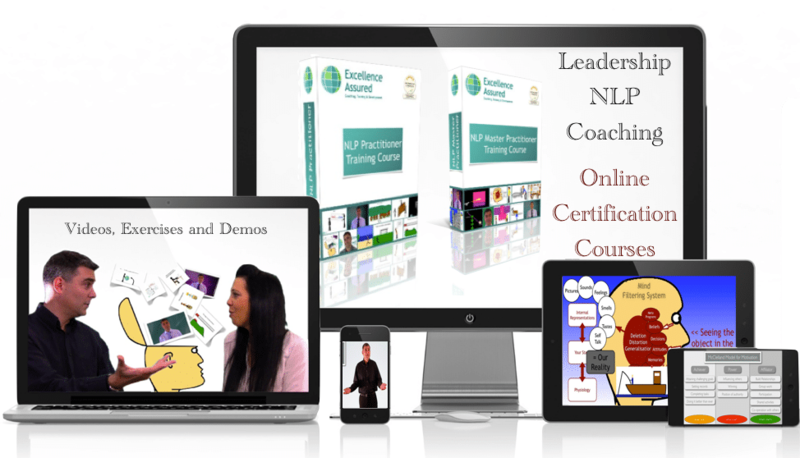 As a world leader in NLP training we support our online courses with live webinar training that backs up our outstanding online material. This training incorporates the techniques of accelerated learning and is designed to appeal to all learning styles. The videos provide visual and auditory instruction and visual learning anchors via our animations. Kinesthetic learners (learners with a preference for hands on learning) benefit from the many exercises that are contained in the manuals and in the videos. Expert tutorial support throughout your course. When you register on your course we will allocate a course tutor to you. You have optional access to coaching and tutoring with our course tutors via email and Skype. No need to wait, you can start your NLP Training online today! Start creating your own future now! I am really enjoying the course so far! I took the NLP Master Practitioner course with Excellence Assured. The communication was excellent right from the start. My Tutor (Anthony) was super-responsive and gave me feedback on submitted work promptly. He gave me invaluable advice and, not only gave feedback, but asked pertinent questions that made me check my understanding. I’m really happy with the level of service, quality of teaching & learning materials, and the content and depth of the course. I’ve learned such a lot. Thanks so much for your quick reply…… I have already downloaded the NLP Practitioner Course from your website. I am really excited to get started in my free time on the ship!! Thanks for your kind consideration, time and patience, I really appreciate it!! You are a true customer service Super Star!! Thanks again!!! There are two stages of professional NLP qualification (&training) before NLP Trainer level, NLP Practitioner and NLP Master Practitioner. The NLP Practitioner Course is the first stage and NLP Master Practitioner Course is the second stage. 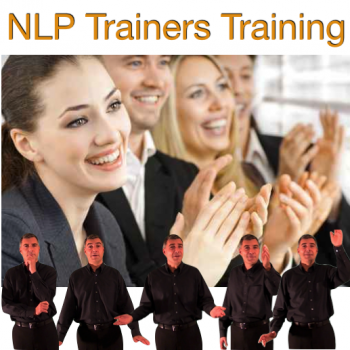 In addition you may wish to further advance your skills by becoming a trainer of NLP. Limited offer – Make your investment in any of our NLP training courses or combination packages today and in addition to our published discounts you will receive our exclusive Mindfulness course for FREE. 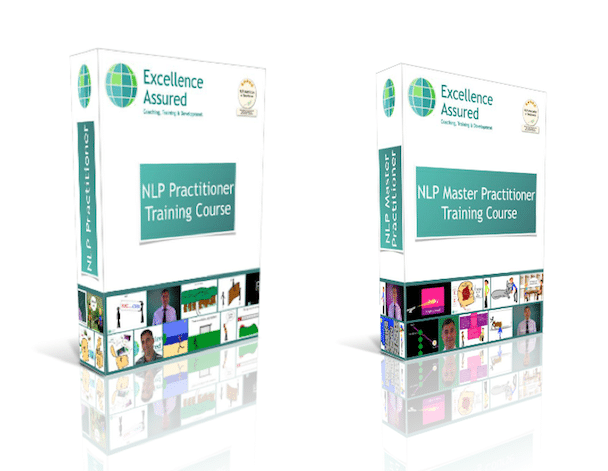 If you already have some experience in NLP, either as an NLP Practitioner or NLP Master Practitioner, and you wish to take your training to the ultimate level and train to train others in NLP, then we provide an online NLP Trainers Training course. 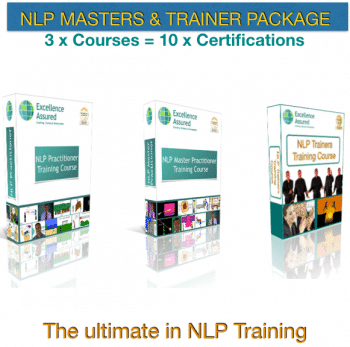 The ultimate NLP Training package. 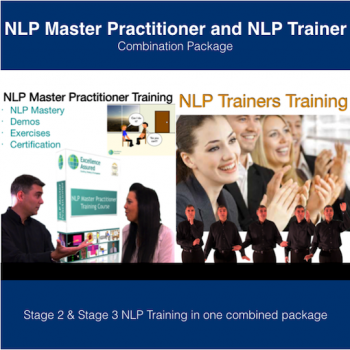 Combine all of our NLP Trainings into one package and save. 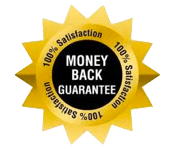 The complete NLP training journey, NLP Practitioner, NLP Master Practitioner (Premium NLP Masters Training) plus NLP Trainers Training course giving you five professional certifications. Although it isn’t listed as an option above we do have the facility for you to take the NLP Master Practitioner and NLP Trainer courses as a package. This package assumes knowledge at the Practitioner level. Please contact us for details and availability. Our online NLP training courses are currently very competitively priced, the content is world-class and our intention is to provide you with a training experience that is every bit as good as attending a hotel based or residential NLP training. 70%+ of our new course registrations come as a result of recommendation from our current and past course participants. As a result, these courses are highly sought after. We want to ensure that you receive the best possible service from us throughout your training. We therefore limit the number of students that we have on each of our courses. Our NLP courses will provide you with recognised professional qualifications wherever you are in the world. You will receive physical certificates from us that will be posted out to you. Once qualified you may choose to use your new qualifications in an existing business or you may decide to enter into a new career. These online NLP courses are designed to support you not only in learning NLP but also applying it in your life and business going forward. Coaching – Interested in setting up a practice and becoming a Life Coach, NLP Coach, Business Coach, Sports Coach or Executive Coach? Therapy – NLP compliments other ‘talking therapies’ and provides vital additional skills, tools and techniques for Counsellors and Psychotherapists. Therapists in the UK offering NLP Therapy in private practice are typically able to charge £60-£100 per hour for their services. NLP is now used as a key skill in various areas of the UK National Health Service (smoking cessation, weight loss being just two areas). Management & HR – A professional NLP qualification is recognised in many industries now as a stamp of excellence, a guarantee of excellence in communication skills and people management. The key benefits to you are faster promotion, becoming more attractive to future employers, help businesses improve team performance, and retention of staff. Sales – Salespeople love our NLP Training! Previous graduates from our courses have reported doubling their income by using these NLP techniques in their sales process. Education – Teachers, Lecturers and other educators applying NLP skills to the benefit of their students have reported accelerated learning, longer knowledge retention and improved learner attention. 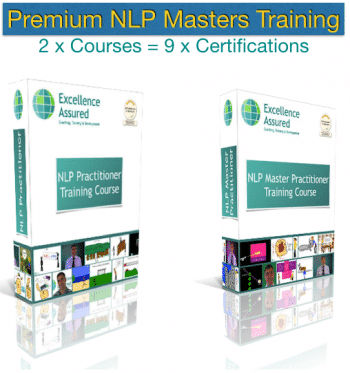 Your own business in NLP Training – There is no more rewarding way to earn a living. Teach others NLP and run your own NLP training courses, sign your own NLP Practitioner and Master Practitioner certificates. Take our NLP Trainers Training or Masters & Trainer combi program and this career path can be yours! At Excellence Assured we are proud to associate with the NLP Association of Excellence (NLPEA). 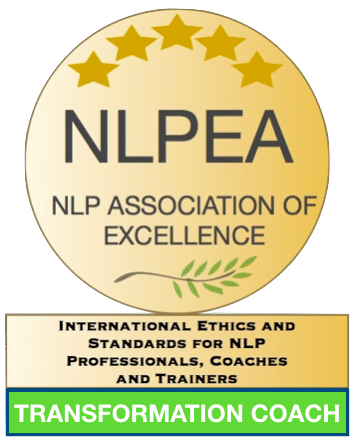 NLPEA provide our professional standards, ethics and accreditation for NLP Trainings. 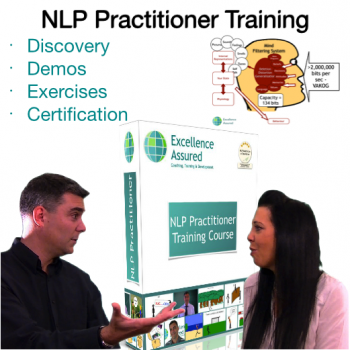 Our online NLP courses are accredited by the NLPEA. NLPEA are one of the worlds fastest growing accreditation bodies of NLP. They are a not for profit, international membership organisation for NLP professionals, coaches and trainers. Their qualifications are recognised throughout the world as a stamp of quality and excellence, and the organisation is renowned for its commitment to furthering the development of NLP and extending the global availability of NLP trainings. Once you qualify from one of our courses we will register you with the NLPEA for free lifetime membership – saving you the £499 ($664 USD) that they normally charge as a joining fee. 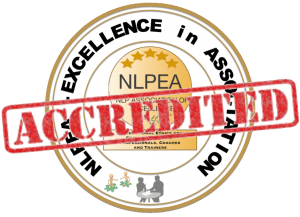 You will be able to use the NLPEA logo to market your own NLP services once you qualify from our course and become a member. Upon qualification from these NLP courses you will receive your certificates from us via post (or you can receive a scanned copy of the original if you prefer). 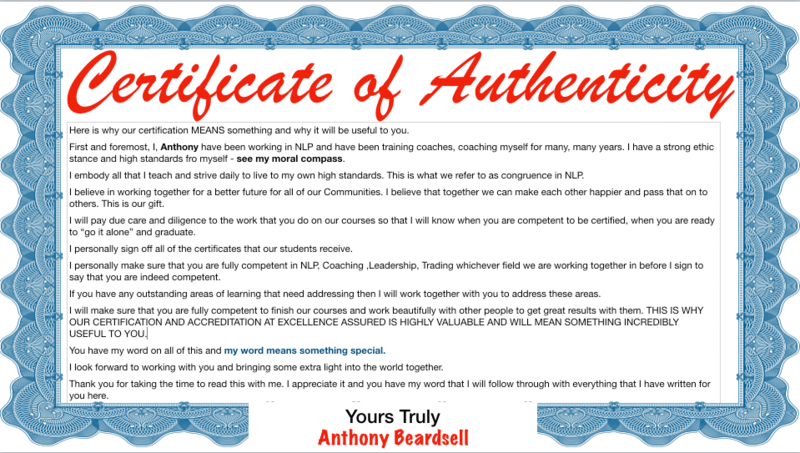 We offer identical certificates to those provided to the students of our live “classroom” NLP courses. It is our aim for every student to meet the criteria for qualification given time. We have a 100% pass rate on our courses for students who fully complete the program. Every module on your course has exercises for you to do and we ask you to report back to your course tutor on your learnings and experiences from the various modules. We provide you with questions to answer which help you to reflect on and integrate your learning. These self reflection exercises are the method that we use to asses your new skills and your ongoing learning throughout your course. Your course tutor will provide feedback on your reflections and ask further questions if need be. These are international NLP courses and we do recognise that English may not be your first language. Our tutors are experienced in working with students of all nationalities. This is how we will work together on your course to build your skills in NLP and finally certify you as an NLP professional. I have to admit, that I was a initially little wary of spending so much money on what I perceived may turn out to be another internet correspondence course filled with scant information and padded out with ‘filler’ information that I already knew(and believe me I’ve wasted enough money on so-called internet ‘training courses’!). From my experience of completing this NLP Practitioner course, I have to say that this is the future of online training and I’m pleased I made the investment and I’m now looking forward to progressing through the Masters and Train the Trainer. The whole training program is well balanced with audio-visual aids as well as self-study. The video classes are clear, well-structured and concise leading from one to another in a way that guides the student to learning and understanding of each module without going ‘over their head’. The supporting manual is excellent and I’ve been very impressed by not only your personal mentoring and feedback but also your in-depth knowledge of NLP. It has already demonstrated to me that I’m on track to gain the same skills, knowledge and experience in NLP that I have as a hypnotherapist (although I still and always will regard myself as ‘still a student whom learns from each client I engage with’). As I mentioned at the start of this training, I have been a qualified hypnotherapist for more than 17 years, practicing in the UK but currently working/living in the Middle East (mainly involved with technical training in my current role) and have demonstrated NLP techniques in training sessions and have now been asked to run NLP trainings here. I’ll be working hard towards obtaining my Masters & Trainers Qualifications so I can have my training accredited and issue certificates. I look forward to the rest of the journey with you Anthony – I’m enjoying the ride so far! Hi Anthony I thought that I would just update you on my progress. As you know it has been six months now since I qualified as an NLP Practitioner through your online NLP Training programme. I have been very busy! When I finished the course I followed your suggestions on how to set up my part-time coaching practice and managed to get some clients early on via some local newspaper ads. Those NLP Language Patterns work a treat! The sessions with the clients went really well and I had some great successes especially in working on creating a more empowering future, visionary goal setting, habit change and changing limiting beliefs. It worked just as planned, my clients were delighted and I have had a number of recommendations from them to other clients. I am now planning my full-time future in coaching next year. Thanks again for a brilliant course, it has been instrumental in my success so far. I completed your Premium NLP Masters Course recently, which was really well presented by the way. I just wanted to say a big thank you! As you know my main goal was to get back to work and into a career that fulfilled me. I used many of the skills in my interviews that you taught so excellently on the course and the feedback was great from each one. I have just got my dream job managing a small HR department. I can’t wait to use all of those people skills from the course with my staff and look forward to getting some great results with them. Although the NLP qualifications were not required for the job I definitely think that they helped secure the position, so thank you once again. For anyone considering doing an NLP course with you I just wanted to say, “do it you will not look back!” I am a therapist and had heard lots about NLP before taking your online NLP Masters course. The reports do not do NLP justice by any means! I have never discharged so many patients after such a short amount of time since I started using my NLP techniques in my private practice. I was worried at first that cutting the number of sessions that I have with patients would affect the results and my earnings! However just as you said the results have been superb and lasting and I have never been so frequently recommended. That is what getting great results does for you! I really thank you for everything. These courses were really interesting and motivating. And they still are… as I use them to come back and redo some sequences from time to time. I didn’t tell you before, because I didn’t want to influence your point on view on me during the training, but the way you teach is really magic (there is no “over” compliment there, just an analysis). When I listen to a course, sometimes words are flowing and I don’t really understand all the words (I don’t have all the vocabulary in English :)) But after the course it is like every things said is an evidence. It is like you write directly in the mind. A very interesting effect. I took some sequence and analysed them, the secret seems to be in the hypnotic language, voice anchoring, and…. all that you are doing in the presentation. If you remember, when I started, I was a little bit shy, because I was not sure to understand every thing and it was a real challenge to do this in English. I heard and I saw a lot of people on the internet saying that elearning is not a good thing in NLP, they said that people need to be present in a live course. Today I’m sure of something, it is that if you prepare good course and if you coach students as you have done with me, you can have a really good result. As good as in a live course and maybe a better result for some people than in a live course, because people can take the time to integrate all the principles. I really appreciate your feedback throughout the year and this course is truly excellence! I can tell that you put a lot of effort into the design of this course, and I particular enjoy the fact that later modules require a combination of multiple techniques to master. Thank you so much for your help and you are truly an outstanding NLP trainer! I admire your ethos and the positive intentions that you put across – it has absolutely been a job very well done on your part indeed. As soon as I found you and Excellence Assured I knew that I had found the correct people to take me forward. There seem to be hundreds of NLP companies and coaches out there on the web. I doubt that any will be a patch on Excellence Assured. The courses that you have created are truly outstanding. People like people who are like them, and I feel we are alike in many ways. I aim to help others in much the same way as you have helped me – don’t worry, be assured that I will pay it forward in the best possbile way. I would now like to take this opportunity to thank you for everything that you have put into the courses, for the endless hours and huge commitment it must have been. I would like to thank you for making it possible for people like me to access top quality training in the most accessible format possible. Finally I would like to thank you for providing such excellent feedback on my work and facilitating for my growth as a result. Helping people to become more…can there be any better vocation? Still wondering what the benefits of this training will be to you? Find out how this NLP training will benefit you. Start your NLP training today.